My name ‘s Guide and here’s Amy, my fiancé. We are a family blog wishing you can find useful information about our passionate cooking and eating Thai Food. I believe when I cook Thai food myself at home, I feel healthier not only because the ingredients are naturally nutritious, but the way you’re preparing as well. So, I create the blog wishing you can find any useful information about cooking Thai food and recipes, especially while you’re outside of Thailand. Of course, I was born in Thailand, and I grew up surrounded by Thai Street food. So, yes! Thai food is my favorite food because it has a balancing combination of three tastes: sweet, salty, and sour. 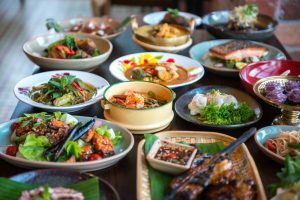 It doesn’t always have to be on one single plate to have all tastes, but Thai people prefer to have at least three flavors together in their meal including sauce and condiment. For example, if I have my plate filled with jasmine rice(slightly sweet), I will gather my meal with a bowl of Tom Zap soup(sour-salty), stir-fried rice(salty-greasy), and Num Jim Seafood(distinctive sour) to enhance overall. 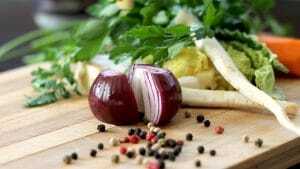 Another reason is Thai food has many ingredients that benefit to health. There are many types of vegetables and herbs growing in the tropical weather. If you select how you consume wisely, you’ll get the most out of it. I have been discovering some of the Eastern Asian produce at local Asian grocery stores near me(Seattle) and Amazon store* in the US, and it challenges me to cook REAL Thai food when away from home. Follow me if you love Thai food as like we do, and get our free e-book: A Quick Guide To 11-Methods of Home-Cooking. *as we partner up with Amazon Associate Program, everything we list from Amazon store we truly use and honestly recommend. We receive a small commission from advertisement and affiliate program. So, don’t worry there’s no extra cost to you if you click through those links or make any purchases. Why do we create this blog? My second passion is reading. I enjoy reading both Thai and English in non-fiction books, short stories, inspirational diaries, cookbooks, self-improvement books, and more. After reading becomes fun, it turns to write. I only think if I may have a chance to write something and publish what I’ve learned. However, my weak spot is vocabulary and well-explanation(even when I speak). So, I create the blog for my desire to write. Well, I know that it’s not about just write anything. I’ve been a chef for Thai restaurants for many years. I’ve seen people from different cultures dining, taking out Thai food. They love it! They eat Thai food! And, I love Thai food. So, I need to write about food as it’s on my number one’s passion, cooking. Then, Unipan Kitchen is created to showcase recipes of Authentic Thai food and Asian fusions. The recipes need to be easy to prepare for home-cooking(as I want you to cook it yourself rather than taking out) and easy to find ingredients(as we connect the world’s largest market). I’m all ears what people are looking for when they want to cook ethnic food. Feel free to leave a comment on the post or send us an email. Unipan Kitchen encourages you to cook it yourself and wants you to eat Thai food as a part of your lifestyle. We’re here to help you build your recipe ideas, find the right ingredients, get cooking efficiently and maintain your diet. Besides, Thai cooking 101 is for anyone who wants to jump-start to Thai food cooking. 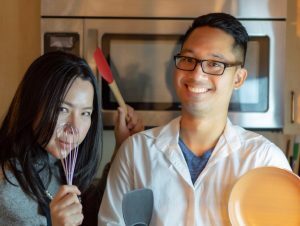 We offer a Free e-book: A Quick Guide To 11 Methods of Home-Cooking in exchange for your lovely e-mail because if you find this useful, we love to connect personally with you. I was born in Bangkok and grew up around the street food market. My first name pronounced Soo-Cha-Nin. My house is a 10-min walk to a 24-hour food stall market. So, my mother, La-or, doesn’t have to cook every single day but buying grab-and-go and prepare for the dinner instead. My mom liked to cook on weekends and have me as an assistant. Since I was ten years old, I’ve been helping her with preparing food including cutting, slicing, squeezing juices, stirring, and started learning to cook simple food, such as stir-fried vegetables, simple soups, and cook kinds of rice. Later, I sailed the world and ended up here in Washington state as an exchange student to learn English in 2007, and became a resident later on. What’s my background in cooking? I’ve never attended a culinary school or professional cooking academy at all. All I’ve learned is from real-life experience and self-studying. 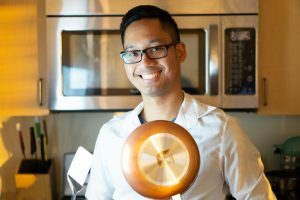 The first three-year in the US, I worked as a dishwasher, a busboy, and a host at Thai restaurants in a small town close to the Seattle area. The first food I started cooking for money was Pad Thai (just Pad Thai every day! ), and I could earn it with a decent paycheck. She inspired cooking is my passion. Then, I learned it in many ways: cookbooks, Youtube, Blogs, and cooking at home. I was struggling to practice English, culture adjustment, learning to cook at the same time for years. I’ve worked as a line cook for a couple of years, and one day I became a chef, and it turned out to be so fun because I could connect with the server, prep man and cooks. I came across that to be a chef is what I love because I could cook, lead, and teach. But now, my knowledge settles. I know I need to connect the world to learn more, so I start the blog to give and receive. Give the world a better lifestyle of cooking and eating and earn a chance of learning new things from the blogger’s network. Her real name in Thai is Siriwan, Si-Ri-Waan. She is my web designer, photographer, editor, recipe developer, and a life partner. 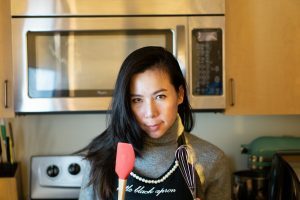 She has been in the Thai restaurant industry for eight years+, and she sees how people have opened the door of Thai kitchen to international culinary. She says people like Thai food more and more because of its vibrant flavor and complex aromatic herbs and spices. Moreover, she has a passion to encourage anyone to cook and eat Thai food to have a healthy lifestyle. No needs to consume bland meats, steamed veggies and the hard-boiled egg for your diet. What’s her background in cooking? Amy grew up in Phetchaburi where was a center of sweet treat and dessert. She was surrounded with the best local food stall in town, and her experience of eating was at a high level. She didn’t even have to cook, but her mother, Jomkwan, preferred to perform home-cooking as she realized it was healthier and safer. Please tell what is your favorite Thai food you want us to create. What's your favorite Thai food? By submitting your e-mail, you are joining Unipan Kitchen list, and you will receive our free e-book in exchange for your idea as well Thank You! Passions: cooking and discovering new recipes, reading, writing, photography, hiking, snowboarding, and restaurant hopping. Passions: exploring and reviewing restaurants, watching shows(especially food), developing recipes, food presenting, and traveling.